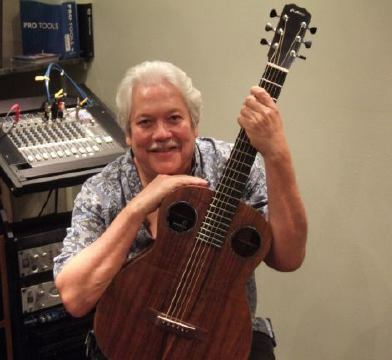 "I played my Dennis Lake Pō Mahina double ported koa guitar in concert for the very first time last night. Its beautiful tone swept the theatre like a warm breeze. After I played the first few chords at sound check, a hush came over the back of the room where the tech people were. The sound engineer told me it was the most beautiful guitar he had ever heard. I whole-heartedly agree. It has a gorgeous depth on the low end and a sweet, pure clarity in the highs. I feel like something truly beautiful has come into my life." "I am proud to endorse the `ukulele of Dennis Lake. I know that they are great, because I play one and love it. It is simply the finest `ukulele I have ever played." "Nona Beamer was one of the most important and beloved figures in Hawai`i. As a teacher, activist, performer, composer and general guardian and proponent of the culture and values of Hawai`i, she stood alone. 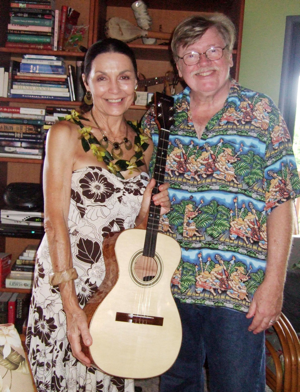 I am proud to offer "Kapuailohia" an `ukulele named in honor of Auntie Nona Kapualihohia Beamer, and designed with her, to her specifications." Kaliko Beamer-Trapp is the hanai son of Aunty Nona Beamer, and brother of Keola. He is widely know as an expert in the Hawaiian language, and is currently teaching at the University of Hawaii in Hilo. 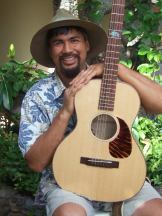 He also travels and performs both alone and with Keola and Moanalani Beamer, and is a writer of Hawaiian language songs. 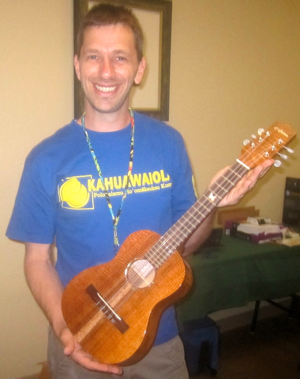 At Aloha Music Camp, his `ukulele and `olelo classes are always among the most popular. He maintains a website dedicated to teaching Hawaiian language and is the President of the Mohala Hou Foundation. 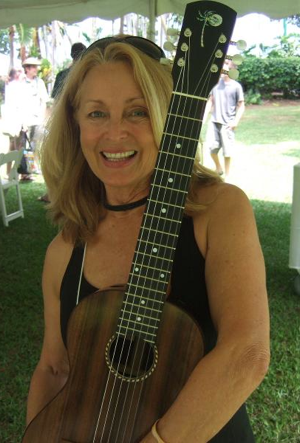 "I love my new ʻukulele! Every time I look down and see that fine orange stripe running along the neck and into the headstock, I am reminded of my hānai mother, Aunty Nona Beamer, whose favorite color was orange. She loved her orange shawls, her orange clothes, and even her orange Crocs! She always regarded the orange and black Kamehameha Butterfly as a very special creature and I am reminded of her to this very day every time I see one flitting about. Her spirit is indeed still with us. When I am seeking advice and direction, I often look for one of her butterflies to give me a sign. And when I am looking for the fifth fret on my ʻukulele, I just look down and there is a stunning glowing butterfly right there to guide me! It makes me think of 'Mā' every time I see it and I know she's with me as I play and sing the songs she taught me." 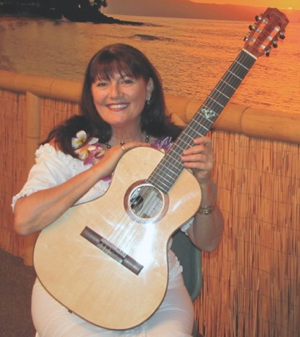 Melinda Carroll at Aloha Camp with her new Po Mahina- It is a 6 string instrument, the size of a Baritone `Ukulele and tuned like a guitar capoed at the 5th fret. 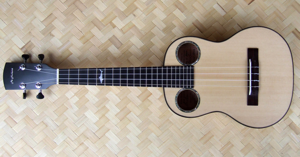 Sometimes called a 'Guitalele", could also be called a travel guitar. This is nylon strung and made of Rosewood with a Sinker Redwood top. Big clear sound, much more than you might expect from a small instrument Melinda has taught songwriting twice at Camp. She is a former recipient of the Na Hoku Hanohano Award for Best Female Vocalist and is currently working with Girl Scouts USA. Buddy was a headliner/stand-up entertainer most of his life. He started out as a young man by putting together a four-part harmony group called The Invitations, the legendary vocal group from the 60's, whose sound still influences Hawaiian music. It was the first group out of Hawaii to go to Los Angeles and record in a major recording studio. The Invitations recordings are still considered a major achievement in the history of Hawaiian music and are worth seeking out. He went on to headline in Waikiki, spent time in Las Vegas and often played with Don Ho. I was privileged to get to know Buudy and his wife Sammi when they moved to Ka'u in 2004. The time I spent with them, and now, the time I am able to spend with Sammi, has always been special to me. In his later years, performing as a duo with Sammi, Buddy often played baritone `ukulele, but preferred a larger instrument than the standard baritone He often played his Martin tenor guitar but with nylon strings- it sounded fine with a pickup, but of course was quiet with nylon baritone strings. Shortly before he passed, together we designed a special instrument for him- basically a large baritone, tenor guitar size, specially designed for nylon strings which would sound great with or without amplification. Recording artist Keoki Kahumoku is a fifth generation slack-key guitarist, ‘ukulele performer, and teacher with deep roots in Hawai‘i. He shares his passion for Hawaiian music and culture through performances and lessons, both in Hawai‘i and on the mainland, as well as at the Kahumoku ‘Ohana Music and Lifestyle Workshop on the Big Island of Hawai‘i every November. Keoki has appeared on five slack-key compilation albums that have gone on to win Grammy awards in the Hawaiian Music category. "Mahalo for building me such a great guitar - this is just what I was hoping for." Tom started performing about twenty years ago. In the last eight or so years, his emphasis has shifted to acoustic fingerstyle music, including Hawaiian Slack Key, Celtic, and Blues styles. A big influence on the development of his songwriting has been the Aloha Music Camp, prodced by Keola Beamer and his family. 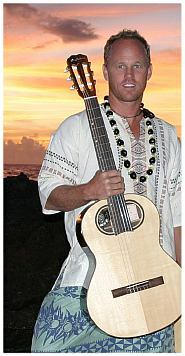 "In addition to being visually stunning, my Po Mahina 12-string is perfect for playing slack key. It holds altered tunings very well and the string spacing and action let me play up the neck with ease. It sounds gorgeous and balanced, and really shines for recording. It is a 12-string players dream." Mark Nelson is a master of guitar, `ukulele, and Appalachian dulcimer, and is an in-demand instructor and performer at festivals, musical camps and clubs throughout the country. 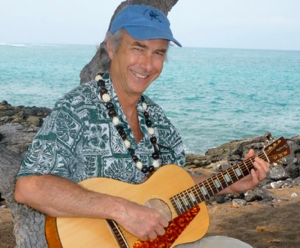 He is the author of numerous best selling books on the Hawaiian slack key guitar, ukulele and Appalachian dulcimer for Mel Bay Publications and his own imprint, Acme Arts. "Dennis has an uncanny ability to make exactly the instrument you need, even if you didn't think you needed a new instrument. My Island Jazz `ukulele is quite simply the best `ukulele in the world, and I'll mud wrestle anyone who says it isn't." "Aloha mai a me mahalo nui! Thank you so much, in every way... for granting my wish that was first spoken at Kaupoa in beautiful Molokaʻi... that sweet evening at Aloha Music Camp when we were all playing music Hawaiian style, Kanikapila, under the brilliant canopy of stars and the chilly wrap of ocean air. I was playing my Slack Key Guitar... then tuning to standard and casually wishing, no, emphatically saying out-loud, "... my next guitar will be a nylon string guitar for my standard tuning songs!" Well, little did I know that someone was listening... and that was you, Dennis! And it was through your generous heart and skilled hands that the heavens answered. It has been a journey of years, all worth the time and seasons." "Her full name is Mamoaliʻi "Baby Gitz" Laʻanui." "As we envisioned, her name is Mamo. Then approaching delivery, her full name was revealed to me. Mamo for our cherished bird whose golden yellow feathers were sought and lovingly gathered for the adornment of Hawaiʻiʻs great ruling chiefs. Aliʻi for the lineage of exceptional koa wood that you chose for the back and sides of her body. The nickname of "Baby Gitz" came to me just days before we came to pick her up... I figured itʻs because she is borne for contemporary music... with a Jazzy edge. And Laʻanui in honor of my ancestor, High Chief Peleʻioholani Laʻanui of Waimea Hawaiʻi and Waialua Oʻahu." "Technically speaking... Mamoʻs shape is a perfect fit! Comfortable to wear. Her song is clear, gentle, resonant, and full. The width of the fretboard is just right... not too wide or too narrow, allowing me ease in movement for playing the varied positions of chords and voice-ings. The pitch of each string is excellent and easily attainable. Overall the tension in the action is perfect. This exceptional guitar inspires me. All of my requested specs and details were met above and beyond! I absolutely love the mother-of-pearl inlay of the Mamo bird in my fretboard! Iʻm looking forward to our years together!" "So... please know that whenever Mamo and I play music together, as every note is produced, both you and your sweet wife Nancy, are present. I am picturing you both... there in the peaceful realm of Naʻalehu, Kaʻu, Hawaiʻi Islan"
I can't imagine life without music. Some people find their instrument at an early age. Others go through life assuming they were meant to play the stereo. I fall into the category of folks who find out that they really are a musician after years of half-hearted attempts at various instruments. "Dennis has the ability to convert a musician's dream into a beautifully crafted work of art. 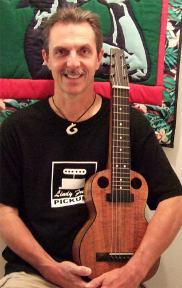 He is respected on the Big Island of Hawai`i as one of the finest luthiers around." 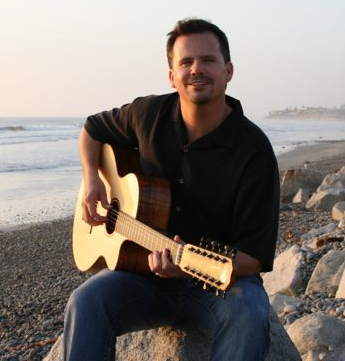 Hawaii born, Chris Yeaton, draws from a lineage of great Hawaiian slack key tradition. His musical inspiration and journey begins with one of Hawaii's most celebrated musicians, master Slack Key guitarist Keola Beamer, and would continue with Big Island Slack Key master John Keawe. Yeaton credits his good friend and guitar guru Gordon Rowland for providing his first opportunity to perform on stage in front of a live audience. Since then he has become more and more interested in performing and sharing his music as well as sharing the venues with other musicians like him through Woodsong Acoustics. "One of the few instruments where you can feel the mana`o or spirit of its creator in your playing. These are beautifully built instruments."